The City of Burlington, a suburb of Philadelphia, is home to over 9,000 residents. Antique shops and boutiques in Burlington’s historic downtown, as well as its popular Riverside Summer Concert series, attract tourists from out of town and around the region. With an active police force, the Burlington Police Department makes frequent arrests for disorderly persons offenses, violations of municipal ordinances, and more serious crimes. If you have been arrested and charged with disorderly conduct, simple assault, DWI, harassment, resisting arrest, or another criminal or traffic offense in Burlington, NJ, the experienced criminal defense lawyers at our firm can assist you. Our featured partner, William C. Fay, has been fighting charges in Burlington for years. With our defense team in your corner, you can trust that your case will be handled with dedication and extensive knowledge of New Jersey criminal laws and defense. Contact our office today at 609-832-3202 to speak with an experienced Burlington criminal defense attorney who will listen to your unique situation and discuss possible options for getting your charges reduced or dismissed. Charges for driving under the influence DWI/DUI, marijuana possession, driving with a suspended license, criminal mischief, shoplifting, municipal ordinance violations, and other offenses are commonly issued in Burlington, NJ. Many of these offenses are known as misdemeanors in other states. 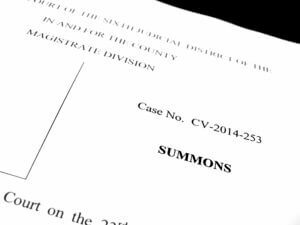 If you are charged with a disorderly persons offense or a traffic offense in Burlington City, your case will be heard at the Burlington Municipal Court. Each year, the court issues thousands of dollars in fines, orders community service, and even sentences individuals to jail time. While a municipal court hearing might not seem very significant, a disorderly persons conviction can carry up to 6 months of jail time, among other harsh consequences. Before facing these potential penalties, hire an experienced criminal defense lawyer to represent you in court in Burlington, NJ. At Burlington Municipal Court, your case will not be heard by a jury because disorderly persons offenses and municipal ordinance violations do not extend the right to a trial by jury. Instead, your case will be heard and decided by a municipal judge. If you are charged with a more serious crime like a first, second, third, or fourth degree indictable offense, your case will be heard at the Burlington County Superior Court. If charged with an indictable offense, you have a right to be indicted by a grand jury and a right to a jury trial. Having an attorney working to undermine the State’s case against you is essential. The Burlington Municipal Court is located at 851 Old York Road in Burlington Twp., NJ 08016. Court office hours are Monday, Wednesday, Thursday, and Friday from 9:00 am to 5:00 pm and Tuesday from 8:00 am to 3:00 pm. Court hearings take place every Tuesday at 8:00 am and Thursday at 5:00 pm. You can contact the municipal court at (609) 239-5825. The presiding judge at Burlington Municipal Court is Judge Dennis McInerney and the court administrator is Rosa Henry. Ms. Henry can be reached by email at rhenry@twp.burlington.nj.us or by phone at (609) 239-5825. For more details, visit the Burlington City Municipal Court’s website. For more information about the City of Burlington including events and contact information for city departments, visit The Historic City of Burlington New Jersey official page. If you need to contact the Burlington Police Department for a non-emergency, they can be reached at (609) 386-3300. To request an accident report, which will be available five business days after an accident, you can contact the Records Office on Tuesdays through Fridays from 9:00 am to 5:00 pm. You cannot obtain accident reports on Mondays. The Burlington Police Department is located at City Hall at 525 High Street in Burlington, NJ 08016. Visit their website for more information. If you are scheduled to appear in Burlington Municipal Court for a DUI charge, disorderly persons charge, or any other violation of New Jersey laws, be sure to obtain the representation of an experienced criminal defense lawyer. Often, your case can be resolved before your trial by having your defense attorney negotiate a deal with the prosecutor or submit a motion to suppress critical evidence that can no longer be used against you. Our Burlington criminal defense attorneys are frequently able to achieve successful results by challenging the prosecution’s evidence or convincing the prosecutor that they do not have a strong case against you. For additional information about how we can help defend your innocence, contact us now at 609-832-3202.